First of all, sorry for the site downtime, was something out of my control but it doesn’t matter now as WE’RE BACK! And with a new post! I had this thought a while ago and completely forgot about it until just now, what would the 2012 F1 season have been like if every single driver had finished every race exactly where they started? The answer, boring! But I went and found out anyway, with some quite interesting results. The qualifying tables are very different to the normal ones, only two drivers have the same positions in both, Nico Rosberg & Kamui Kobayashi, in the Constructors’ there is less movement with half of the teams maintaining the same positions. Michael Schumacher and Pastor Maldonado are the biggest movers from qualifying to race Championship standings, both being five positions higher in the qualifying standings. Unlike the actual 2012 Constructors’ Championship the qualifying one is actually fairly interesting, with the top two positions very close and the next two even closer. As this is using the starting positions the “wins” are actually just poles and the “podiums” top three. Told you they were close! Really shows how badly McLaren have lost out through poor reliability, quite incredibly how there is just a single point difference between them, and the exact same number of points for Ferrari and Lotus. 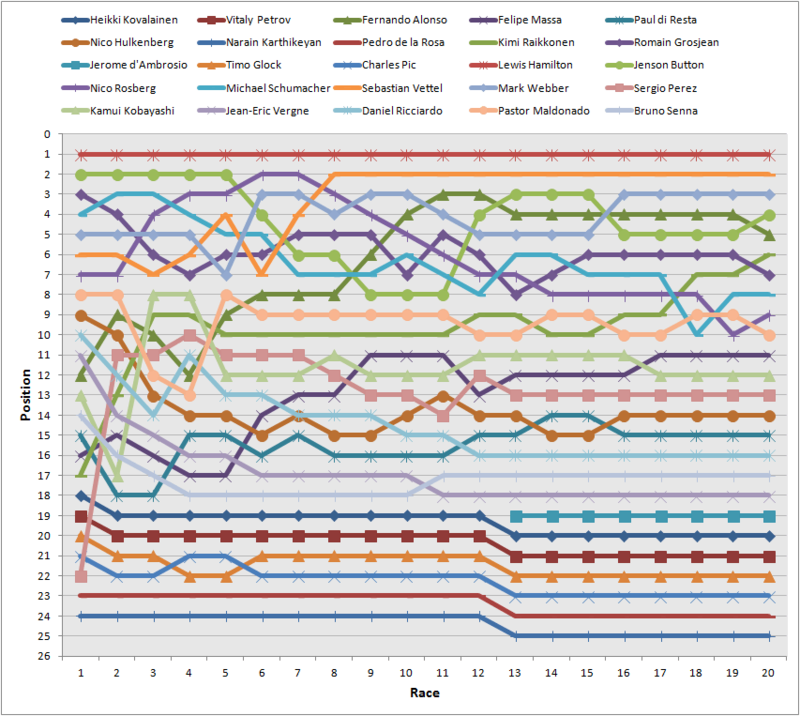 There’s not really too much position movement though, McLaren jump from 3rd to 1st and Williams from 8th to 6th. The interesting one, a lot of changes and the title won after the United States GP. Lost/Gained column is the difference between each drivers’ qualifying and race championship positions. Hamilton’s the qualifying champion but only 4th in the actual Championship because of the many retirements. The difference in points between Maldonado and Senna is quite amazing, never expected the gap to be that big but it’s just further proof about how poor Senna has been in qualifying. The gained/lost column however shows that Senna can make up for his qualifying in the race, which is where former teammate Maldonado loses out due to his many mistakes. Some of you may remember the graphs I’ve done previously showing the Drivers’ Championship positions after each race, I’ve done another for the qualifying Championship. Amazingly Hamilton would have led the qualifying Championship for the entire season, the two Mercedes started quite well before dropping down while Ferrari did the opposite, a slow start with a strong finish. That’s really interesting! Do you think points should be awarded for qualifying? With the old points system (10-8-6-5-4-3-2-1) an extra few points for pole and fastest lap (like in GP2/3) it would be pretty good. But with the current 25 for a win I don’t think so, they have too many points already. Interesting that Ham-Ros were 1-2 for races 6 and 7. Wonder if that shows that next year will be quite close between the two of them. Does it also show that the car developed towards Schumacher as the season went on? He finished above Rosberg in the end, with a stronger second half of the season when the car had less pace! But I guess his pole lap at Monaco still shows he has it..